So, whilst I bought my cab and didn’t notice the odd drivers seat it never bothered me, until of course my mate pointed it out to me recent and now it’s bloody obvious I did however notice that the airbag cover on the steering wheel and the left panel on the centre consul was a different shade to the rest of the interior but thought that it was somehow effected by the sun. Looking at options sticker for the leather the code is CG which although I can’t find this in the list the concensus is that it’s graphite grey for my ‘99 car. Looks like the drivers seat and airbag have been replaced with space grey rather than graphite, if worn heavily or a tear not unreasonable thing to do. Had a similar issue, the previous owner had recoloured but used wrong dye, re-dyed in correct colour and all good. Get the correct dye and redye it's very easy, will need a few coats, easiest to unbolt seats but entirely possible in situ too. Took about 500ml to do 2 seats with multiple coats and will need gliptone leather conditioner g12(?) afterwards. You can do the airbag with it too and any other parts just mask off first. 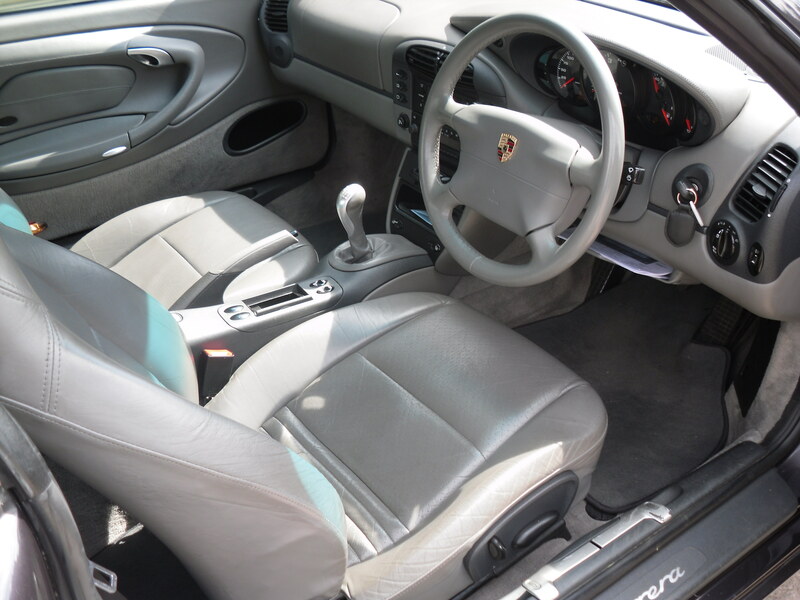 You could have the interior re connolised .. basically its painting the interior leather . Quick search and this should give you an idea ..
Seen it done many times over the years .. always impressive results . Personally I’d look for a black pair of seats and a steering wheel and airbag. The four spoke wheels are a lot cheaper than the three spokes and I believe seats from a Boxster would fit. 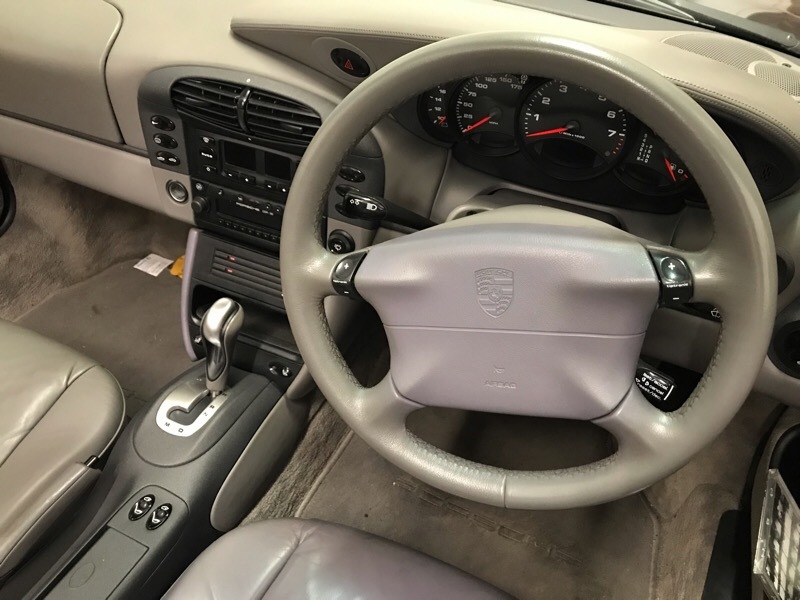 You could probably get away without replacing the rears and it would still look ok.
Whilst dyeing / reconnolising does indeed work really well, if you only do the Driver’s seat and steering wheel I’d be amazed if you achieve a seemless match. Apart from anything else they’ll look like new. I was thinking about a pair of sports seats in black (most popular colour) but didn't want to change the door cards ect. Food for thought.. I used a local trimmer to replace my hood recently, I'll pay him a visit and find out the cost for a change of colour of the existing and weigh up the costs.. The airbag isnt covered in leather, they are vinyl so you will need to source the correct one. Or clean the rim of the wheel with flash, it might go a shade lighter! The seats can both be painted as above to match. The lower dash is a different colour, that is correct. Does your seat heater work on both sides? I rather like it, can't stand dull dark black interiors. get some grpahite grey leather die on line from Gliptone. 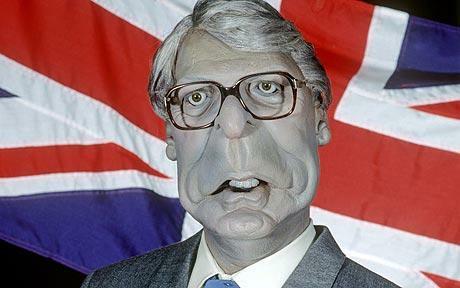 I done mine as it had all faded and it came up a treat. tell them its a Porsche 996 and you need graphite grey. there should be a code for it on the options list too. here is the thread and scroll down. same colour as yours. really easy to do and will be ideal match. 250 ml will be more than enough. I done the whole interior and had a lot left from a large bottle. tell them what areas you want to do and they will advise. Love the grey and of course super fashionable in home design these days too. 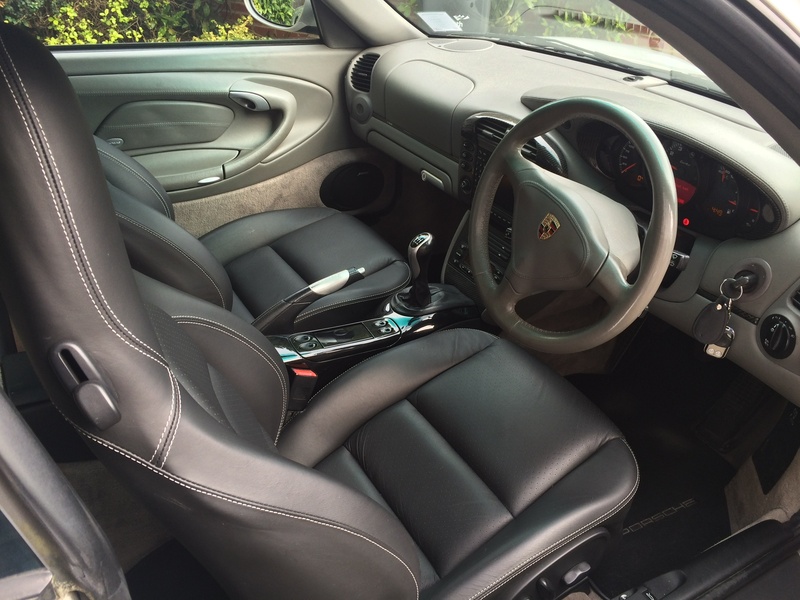 Black seats on a grey interior, with contrasting tunnel and gear stick. I have the rears in black too. That looks good, wasn’t sure it would work. 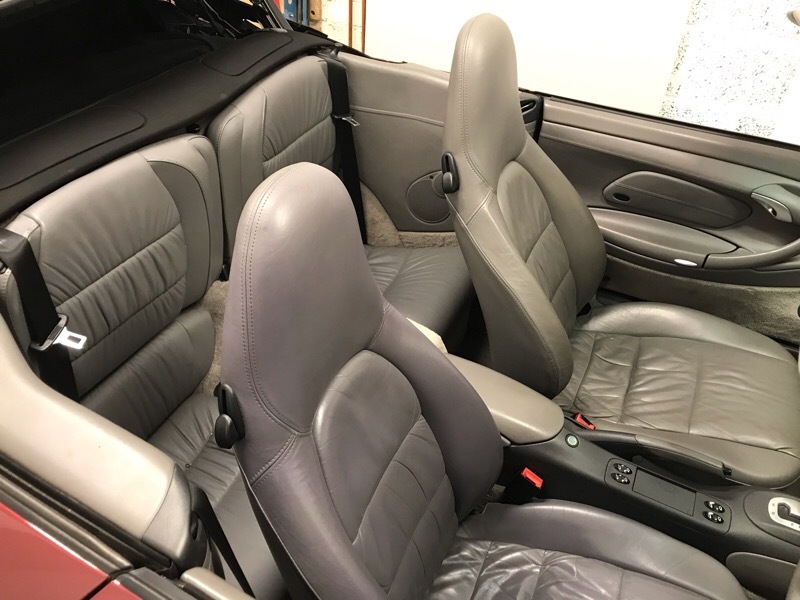 Any chance of a shot a bit further out, really fancy a set of sports seats if I’m going to spend any money on the interior but only seem available in black.